The bank-bound angler's guide to fly fishing the Clackamas River: Your guide will show you where to go, when to go and how to do it. Tour the historic Clackamas from the mouth to Rivermill dam. 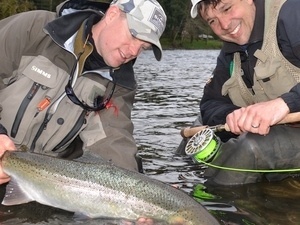 Learn the history and the current state of fisheries on the Clackamas. The on-water fishing session shows you strategies for success. Map with fishing hotspots, local knowledge, fishing lesson and a hot lunch are all included in this action-packed day. From Highway 205, take exit 8 for State Route 43 towards West Linn/Lake Oswego. Turn right onto Willamette Drive. Follow for less than one mile to location on the right.